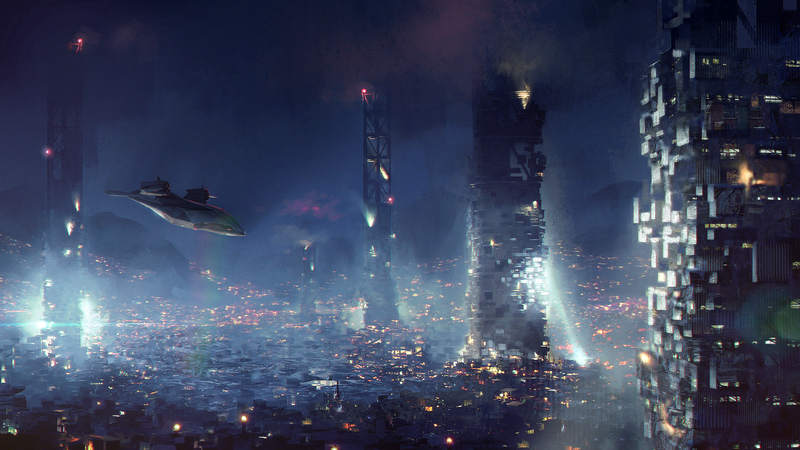 The art behind Eidos Montreal’s grim vision of the future. 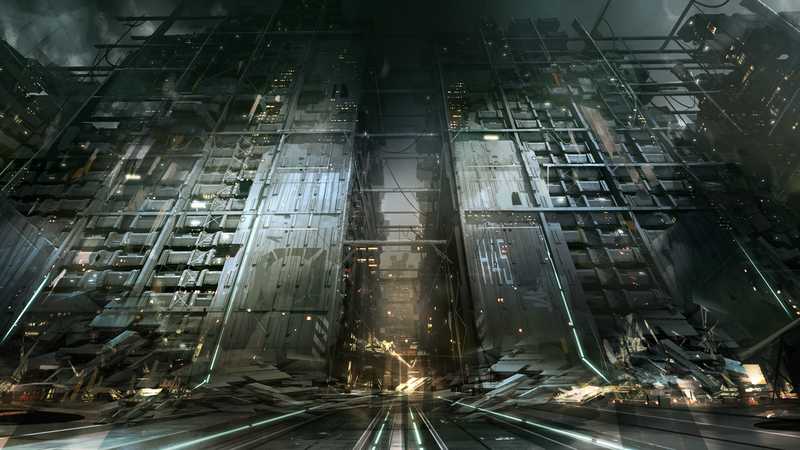 Building futuristic cities as atmospheric and intricate as those in Eidos Montreal’s Deus Ex games is a huge undertaking, but it all starts with concept art. 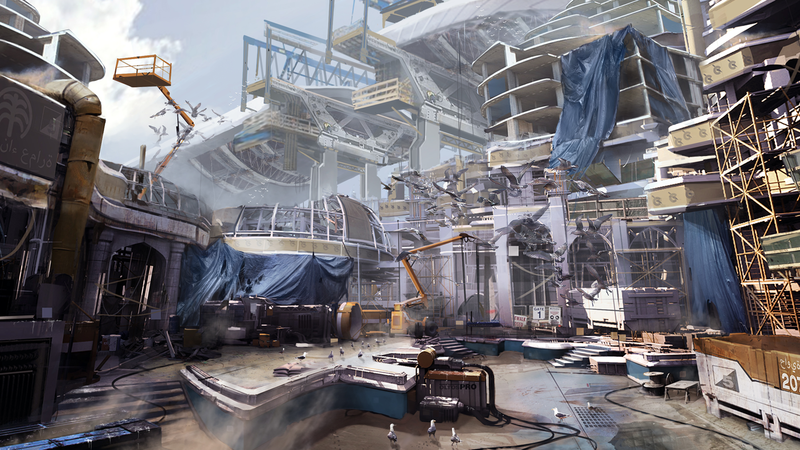 Here I’ve collected some of my favourite pieces from Mankind Divided, which give you an idea of how these worlds are designed. 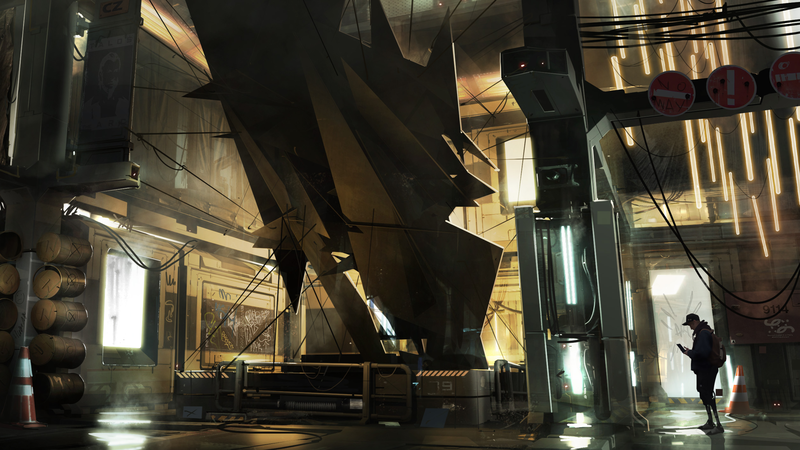 Mankind Divided’s world is a lot more fractured and uncertain than it was in Human Revolution, which gives the game a darker, more dystopian feel. All this striking concept image is missing is some music by Vangelis. 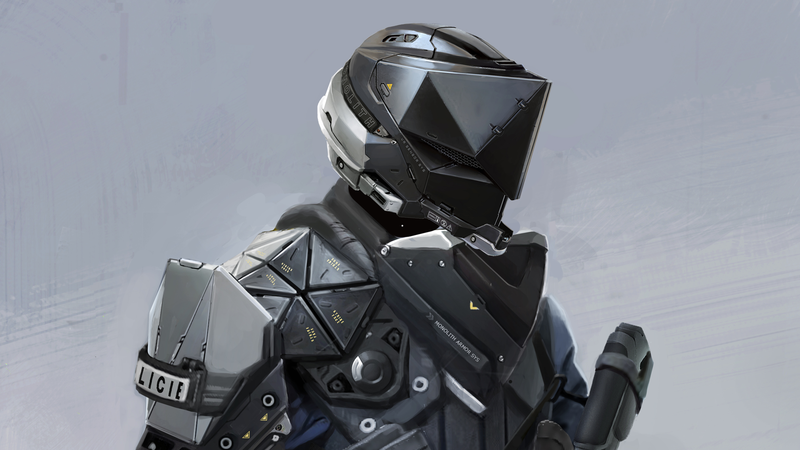 This is one of Jensen’s new experimental augmentations, the pulsed energy projection system, or PEPS for short. It’s a non-lethal projectile that, when upgraded, can target several enemies at once. Elias Chikane is Jensen’s new pilot, replacing Human Revolution’s Faridah Malik. He flies a similar VTOL aircraft, but their relationship isn’t as cosy. Chikane is, like many others, suspicious of anyone with augmentations. Prague’s blend of historical architecture and modern, brutalist structures is one of the game’s coolest visual ideas; almost as if the city itself is augmented. 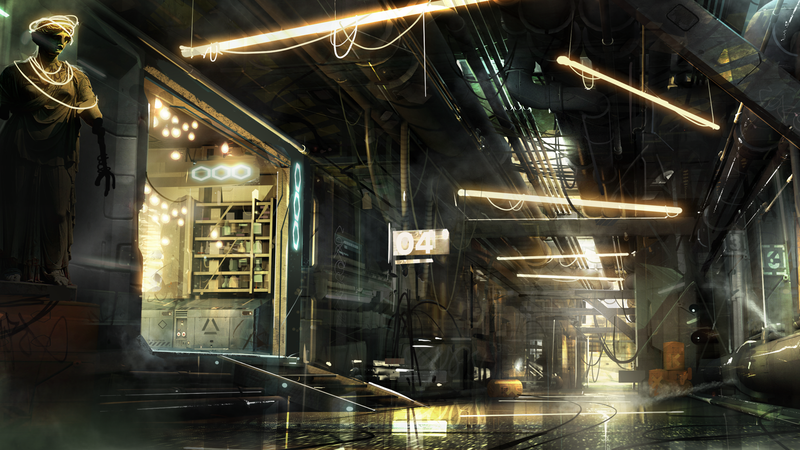 It’s also the first Deus Ex city hub we get to explore during daylight hours. 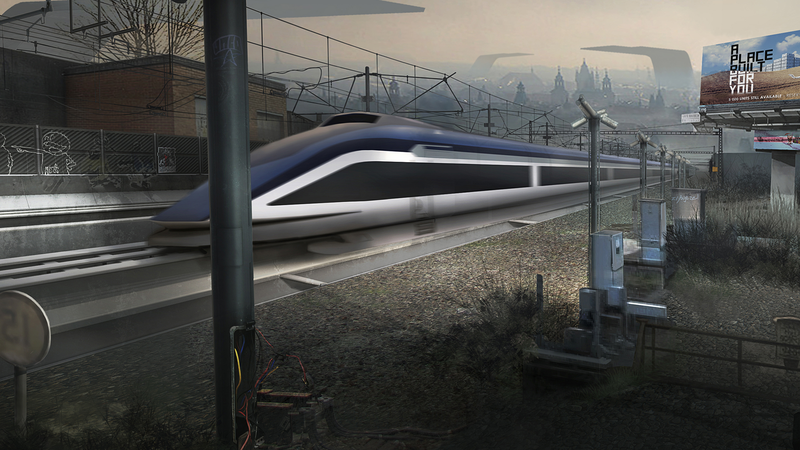 Golem City is a ghetto for augs on the outskirts of Prague. It’s inspired by the Kowloon Walled City, a densely populated settlement that existed in Hong Kong until its demolition in 1994. Here are some photos of the real thing. Jensen hasn’t changed much—he still has his trademark pointy beard—but his wardrobe has been refreshed. 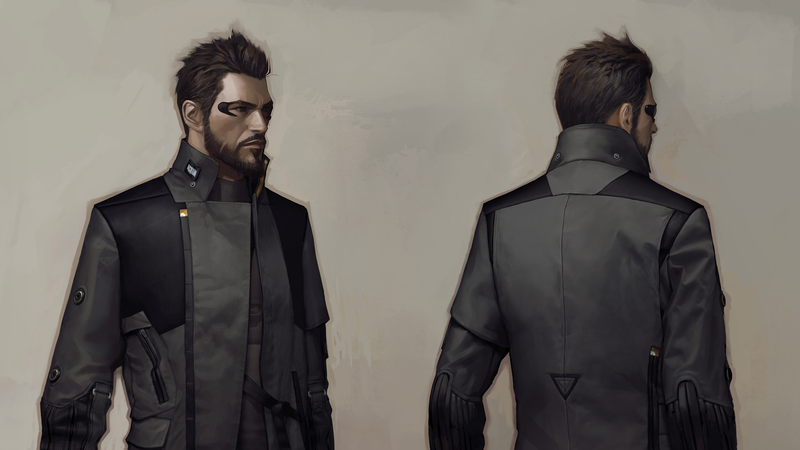 The high collar here is reminiscent of Deckard from Blade Runner’s similarly stylish coat. The makeshift streets of Golem City have been decorated with fluorescent lights, sculptures, and murals. An attempt by the residents, perhaps, to bring some life and personality to an otherwise grim, hopeless place. Jensen arrives in Prague by train. Task Force 29, the Interpol-funded counter-terrorist group he now finds himself working for, are based in the city. Their HQ is underground, hidden beneath an ordinary-looking shop. Jensen visits a commercial area in Golem City, where the streets are lined with market stalls. There’s also a heavily guarded prison nearby, and an optional side mission involves helping someone to break out. Prague is at the centre of an extreme anti-augmentation prejudice sweeping the world. This mistrust is mirrored in their aggressive, militaristic police force, who look more like they’re waging war than keeping the peace. 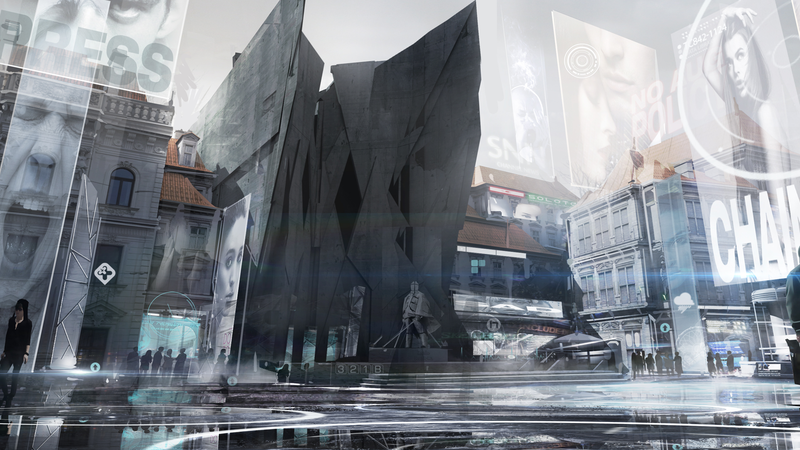 Even though they’re living in a depressing cyberpunk future, the artists in Mankind Divided’s world have decorated the streets of their cities with beautiful, abstract sculptures like this. 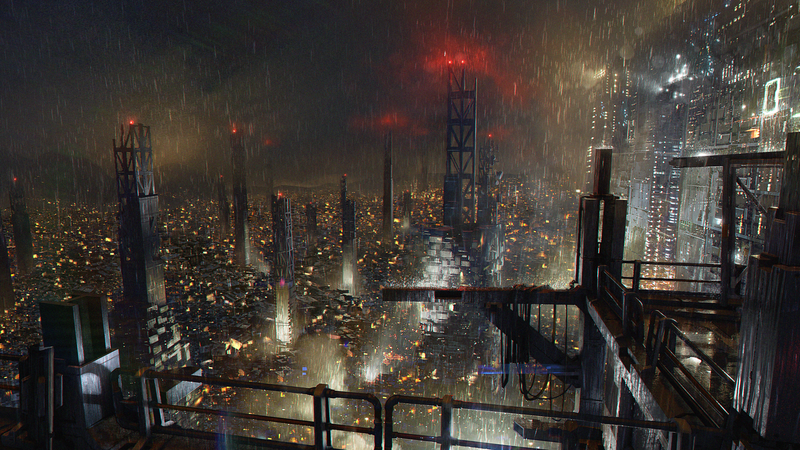 It’s the prettiest dystopia. 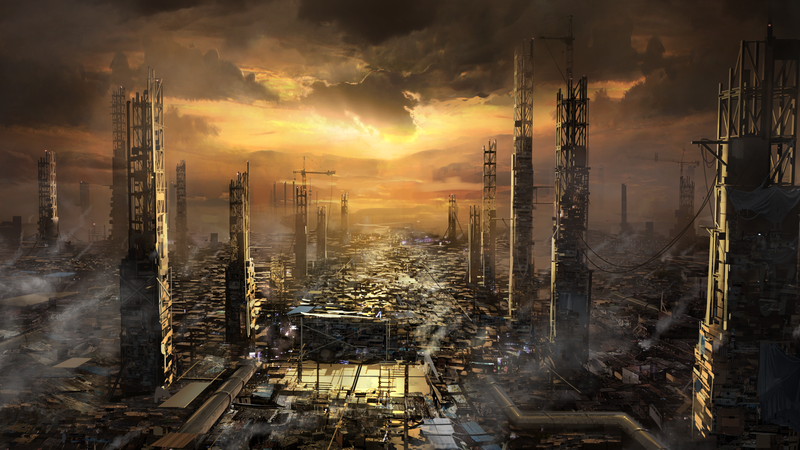 In Mankind Divided we witness the aftermath of the so-called Aug Event, in which augmented people around the world were driven violently insane and millions were killed. This explains why many fear the rise of the technology. 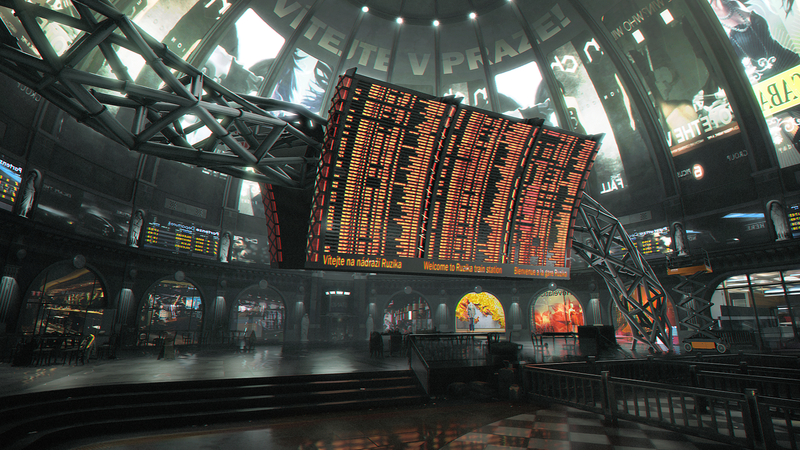 The city hubs in Mankind Divided are much larger and a lot richer in detail than those we explored in Human Revolution. In fact, Detroit and Hengsha feel positively tiny when compared to Prague and Golem City. When Jensen arrives in Prague the train station is attacked by terrorists. He survives, of course, and later finds himself investigating the crime scene. Which would be easy if it wasn’t for the armed police guarding it. 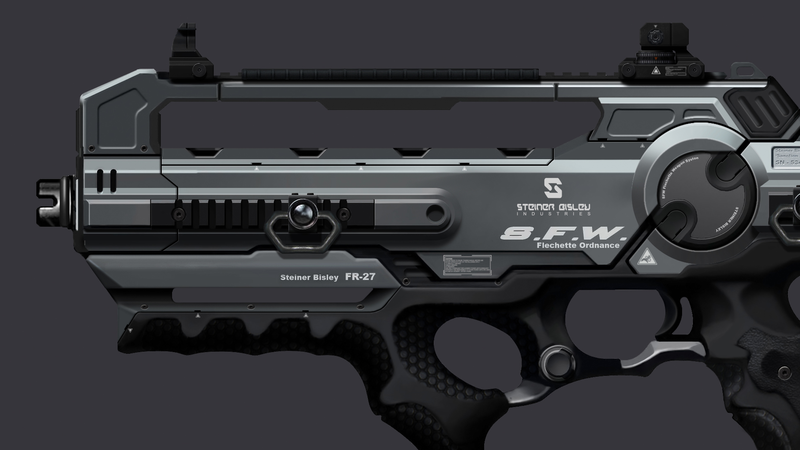 A slightly redesigned version of Human Revolution’s combat rifle. 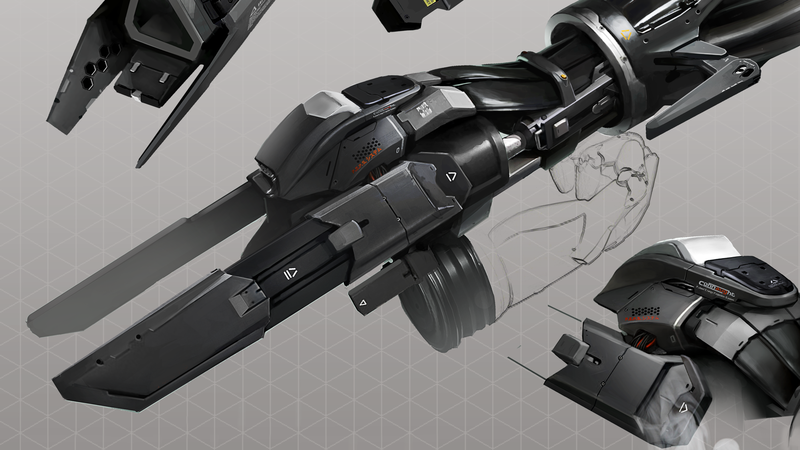 The attention to detail in the game is remarkable, from its many futuristic weapons and vehicles, down to simple props like coffee cups and office furniture. 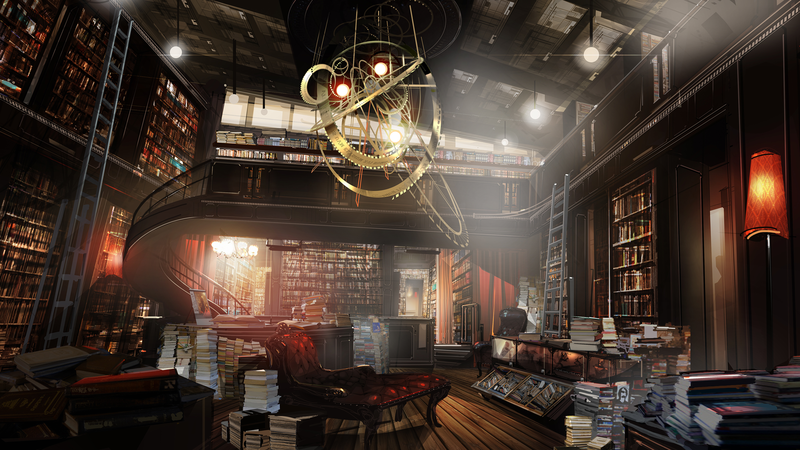 This cluttered bookshop in Prague is owned by Václav Koller, an underground augmentation specialist who Jensen helps out of a tight spot. The entrance to his illegal workshop is hidden, naturally, behind a bookcase. A heavy police presence means tensions are always high in Golem City. As you walk the streets you’ll see augmented people pinned against walls being searched and hovering drones with spotlights scanning for trouble. This is Viktor Marchenko, a member of the Augmented Rights Coalition. 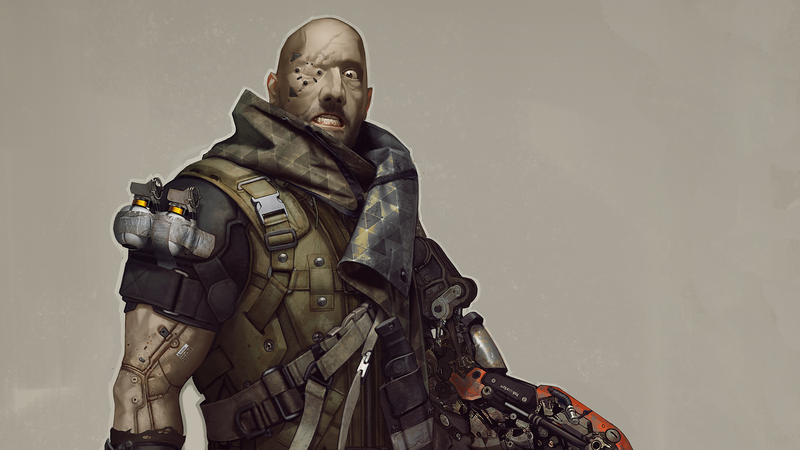 He’s believed to be behind numerous terrorist attacks, despite ARC’s founder, Talos Rucker, being opposed to violence. 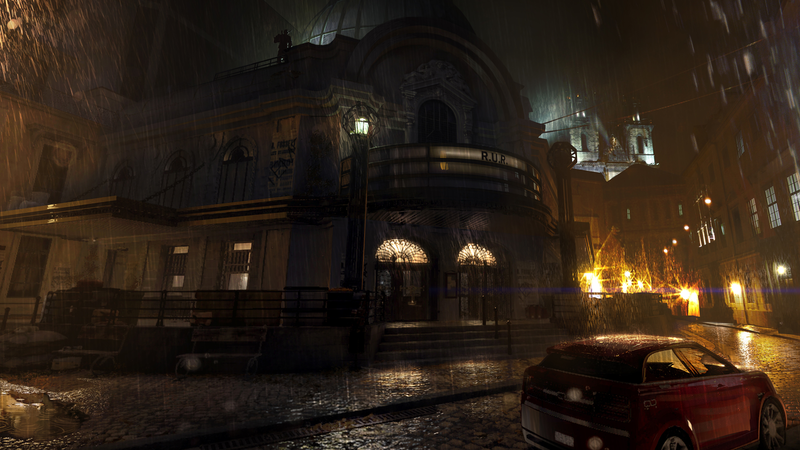 The game’s prologue mission is set in Dubai, in this abandoned, half-built luxury hotel. It serves as a tutorial, reacquainting you with Jensen’s augmentations and giving you a taste of the slightly tweaked controls.